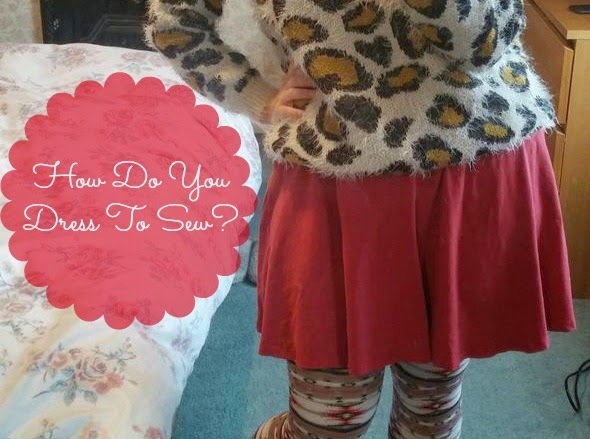 How Do You Dress To Sew? 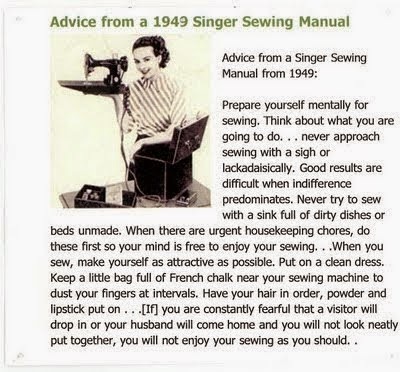 We've all seen the advice from a 1949 Singer Sewing Manual, urging women to tend to their housekeeping first and make themselves as attractive as possible before tackling any sewing. It's antiquated and hilarious, and we've collectively sighed in relief that times have thankfully changed. Although I'm a stickler for housekeeping, I think I've actually gone to the other extreme on the appearance front! 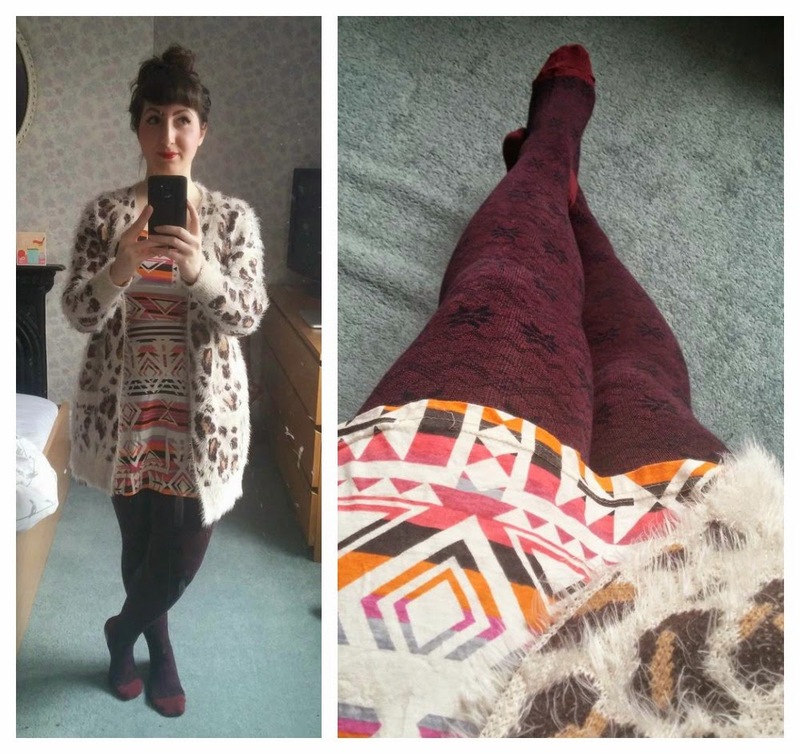 When I'm at home I tend to dress purely for comfort and warmth, resulting in some questionable (ok, ok...outrageous) pattern combinations. I hasten to add that I don't actually leave the house dressed like this...too often! My point being, that when I'm wearing a questionable 'outfit' to begin with and I then try on a patterned me-made to check the fit (because when don't I like a crazy pattern?!?) the result can be interesting (ok, ok...vile) to say the least. When I tried on my Bonnie Birthday Dress so my boyfriend could feedback on the length before I hemmed it, he was quite literally gobsmacked. It was seeing his face at that exact moment that made me wonder if other stitchers ever end up looking like this mid-sewing project. So tell me, how do you dress to sew? Do you think there's a happy medium to be had between glamour and comfort at home? P.S. 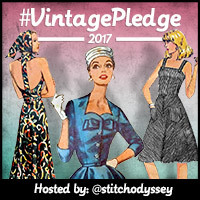 There's a great giveaway over at The Blue Gardenia at the moment - open internationally until midnight PST on Tuesday 17 March. Haha...I don't think I've ever worn stilettos in my life!?! Oooh, nice idea! Might need to make myself a dressing gown first, of course! 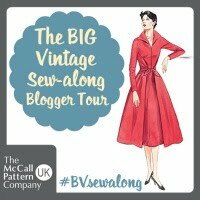 Crikey, it's already hard enough to get time to see with a nearly full time job and two preschoolers, a requirement to be fully groomed first would kill my sewing time off completely! I regularly sew in jeans and a very large, comfy old uni fleece as my downstairs sewing space is freezing! Fitting costume changes are made at speed!! I hear you on the need for speed...seems like everyone's sewing area is chilly! When I get home and know I won't be leaving the house anymore I'll change into my pyjamas at lightning speed. I'll also stay in my pyjamas for as long as possible. So yeah, I'm usually sewing in old pyjamas. Yesss, I love my PJ bottoms!!! I am very much an in my pj's kind of sewer! I love to be able to quickly jump in and out of my newist make for fitting - and pj's are perfect for that! I am a home comfort person too. Sweatpants and a t-shirt, maybe bra and underwear are on - depends on the day and time of day. Definitely barefoot with slippers. I like to use the sewing machine foot pedal barefoot. My boyfriend hates it when I sew because I almost never answer my phone. Haha, yeah...when you're in the sewing zone everything else just fades away! Ha! I love that 'advice'! I try to dress in things that are easy to remove for trying on. Otherwise...there's no actual thought put into it! What an awesome pattern clash... haha!! I usually wear my dressing gown and tights - so certainly not made up by any stretch of the imagination!! The only attention I pay to what I'm wearing when I'm sewing is to make sure it's not a big fluffy jumper that gets caught in all the pins as the garment moves up towards the machine, resulting in enormous pulls. Ask me how I know that! Oh Amy, I hear ya...yet I'm a repeat offender! It mostly depends on what else I've had to do that day, but if I'm just sitting around the house I usually have on some combination of yoga pants, camisole and sweater in an array of mismatched colors; and always barefoot. I have in the past sat around in my underwear if I was in the middle of something that required a lot of trying on during the process. Hehe! Undies is the easiest option if you know fitting is required! Ha ha, that's a hilarious article! I tend to put PJs on as soon as I get home - back ones if I'm expecting the postman or any visitors (they look a little bit more like clothes), and sometimes I even put on gym clothes so I can pretend that the reason I have no make up on and hair scraped back, is because I'm obviously about to do exercise! Pah! If I'm sewing clothes, I wear a tank top and a slip. It makes trying things on super easy since it eliminates taking things on and off. Non-clothing is usually tank top and shorts. Flip flops are a must. When I'm actually sewing I have to be barefoot, so the flip flops make it easy. I dress to try on. 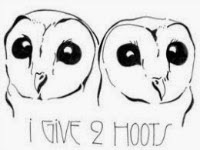 But my 'other' would be sweats and a hoodie, because the sewing room is pretty dang cold in the winter. Did I mention a down vest? And I hate bare foot on metal pedal. Ew. Hmmm, don't think I've ever peddled barefoot!!! I love that last photo! 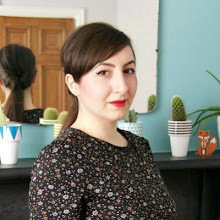 I tend to just wear whatever I have on that day, but if I'm at the fitting stage, if it's a dress or skirt (or presumably trousers, if I ever pluck up the courage), I usually end up sticking on my pyjama bottoms, as they are quicker to whip on and off. Sometimes, I have ended up sewing in my pants though, if another try on is imminent. :) I keep meaning to make some "sewing trousers" for precisely this purpose. There's an undies trend appearing here! usually leggings and a top, something easy to get on and of for quick fit checks and adjustments. 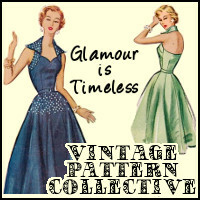 Funny how we like to make pretty clothes, yet look scruffy whilst sewing them! I find myself doing this way too often too... take everything off for a fitting and getting right back at it with not time for redressing. Then later wondering if I'm a freak for sewing in a bra. As antiquated as the ad is, it isn't entirely off the mark, either (gasp!). Whenever I start a new sewing project I have to completely clean and tidy up my sewing room before I can start. I have to put all of my tools away, empty the wastebasket, and vacuum the rug. I can't start a new project unless I have a clean workspace. Also, I do try to at least have some makeup on and look somewhat presentable, because if I want to try on my project midway through, I won't like it on me if I feel that I look like crap. If I put it on, though, and I look halfway decent, that motivates me to keep working! So, yes, it's antiquated advice and it's somewhat cringe-worthy, but the general idea still rings true to me. Your slipper, leggings and dress combo is a so brilliant. I've discovered the joy of wearing joggers around the house, far more comfy than jeans. I love an elasticated waistband. Haha thanks...and yes, elasticated anything all the way! My outfit is similar to yours almost everyday, since I work mostly from home. I wish I could dress up a bit more often at home but I'm just lazy. oh my goodness all this time I thought sewing was a hair up, no makeup , no bra kind of day lol! but now that I'm moving where I have closer neighbors & people fishing off my pier I may better rethink the June Cleaver look LOL LOL!! now I know why the sewing room was the first roomI set up ha ha! Wow...you have a pier!?! I'm so jealous! Personally, I try to wear a simple dress that I can quickly take on and off for fitting. Though during colder weather, I must admit warmth comes first and have been known to try on dresses over my sweat pants. Well, im just gonna say it, I sew in my pyjamas! No makeup, fluffy socks and messy hair up in a bun. Maybe a slick of red lip is the way forward! Hahaha I wear PJs so it is easy to slip on and off for fitting whatever I'm sewing. Plus...comfort! It just seems sensible with all the fitting we have to do! Although I pay little to no mind to my sewing ensemble and sometimes start projects without cleaning my workspace, I do have a friend that mentioned that she ALWAYS sews in work out gear or some kind of lycra because the little threads and bits of fabric don't stick to it! My friend is a genius.